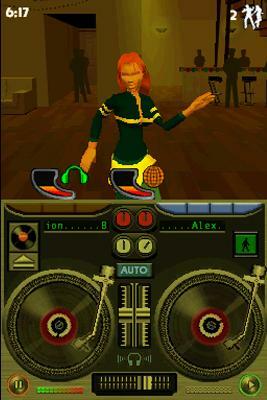 Activision releasing a version of DJ Hero on Nintendo DS is inevitable. What isn’t inevitable though is whether they’ll bundle it with a peripheral like the DS version of Guitar Hero before it. It’s no big deal if it doesn’t happen – Deep Silver’s DJ Star proves that something like this can work just fine without any hunk of plastic hanging out of the DS’s cartridge slot. Any game of the this ilk is going to live or die by its music selection, so it’s fortunate that the developers have had wide enough wallets to be able to include a large selection of licensed music including stuff from Calvin Harris, Eric Prydz, Bob Sinclair and Pharrell Williams. The sound quality is surprisingly good, although the DS’s speakers aren’t really designed for heavy bass lines. At the start only a few tracks are available, with the rest becoming unlocked as your custom-made character starts their clichéd career path of going from a bedroom based disk jockey to a superstar DJ. There’s also a simple to use music creation tool to make your own music with. It reminds me of something I used to play around with on a Sony Ericsson mobile phone about five years ago – just drag and drop beats and away you go. The character creation tool isn’t very sophisticated and the dialect during the static cut-scenes is pretty dire, but the core of the game is solid – it doesn’t take long to become a pro at picking and mixing tracks, adding effects, using the crossfader and adjusting the BPM. There’s an ‘automix’ button that will automatically sync two tracks although you get penalised for using it too often. As your career progresses there are better sets of decks with more features, and there are also some simple mini-games to play that can boost the ‘atmosphere rating’ of the club you’re playing in and will make more people get on the dance floor. Later you can add samples into tracks but they don’t really go with the music – why add an airhorn effect to something like Jamiroquai’s Canned Heat? The echo and ‘noise’ effects are quite good though. Less good; scratching vinyl with the stylus just produces a pre-recorded sound effect. If the Korg DS-10 (Google it) looks too technical and DJ Hero is out of your price range, then DJ Star is a solid and worthy, not to mention cheaper, alternative.